Macrophages are important mediators of chronic inflammation and are prominent in the synovial lining and sublining of patients with rheumatoid arthritis (RA). Recently, we demonstrated increased TLR2 and TLR4 expression and increased response to microbial TLR2 and TLR4 ligands in macrophages from the joints of RA. The current study characterized the expression of the 96-kDa heat shock glycoprotein (gp96) in the joints of RA and its role as an endogenous TLR ligand to promote innate immunity in RA. gp96 was increased in RA compared with osteoarthritis and arthritis-free control synovial tissues. The expression of gp96 strongly correlated with inflammation and synovial lining thickness. gp96 was increased in synovial fluid from the joints of RA compared with disease controls. Recombinant gp96 was a potent activator of macrophages and the activation was mediated primarily through TLR2 signaling. The cellular response to gp96 was significantly stronger with RA synovial macrophages compared with peripheral blood monocytes from RA or healthy controls. The transcription of TLR2, TNF-α, and IL-8, but not TLR4, was significantly induced by gp96, and the induction was significantly greater in purified RA synovial macrophages. The expression of TLR2, but not TLR4, on synovial fluid macrophages strongly correlated with the level of gp96 in the synovial fluid. The present study documents the potential role of gp96 as an endogenous TLR2 ligand in RA and provides insight into the mechanism by which gp96 promotes the chronic inflammation of RA, identifying gp96 as a potential new therapeutic target. Macrophages, that are prominent in the lining and sublining of joints from patients with rheumatoid arthritis (RA)3 are important mediators of chronic inflammation. Synovial macrophages express high levels of cytokines and chemokines such as IL-1β, TNF-α, GM-CSF, IL-6, and IL-8, which mediate inflammation and cartilage and bone destruction (1, 2). Although the mechanisms contributing to the persistent activation of macrophages in RA are not clear, a number of factors have been described, such as T cell-released cytokines IL-17 and IFN-γ, autoantibodies and resulting immune complexes, and cell-cell contact between macrophages and T cells or macrophages and fibroblasts (3, 4, 5, 6). The potential role of TLR has been suggested since TLR2 and TLR4 are expressed in RA synovial tissue (7, 8, 9, 10). We recently demonstrated that macrophages from the joints of patients with RA expressed more TLR2 and TLR4 and that their activation by microbial TLR2 and TLR4 ligands was increased compared with control macrophages (11). Furthermore, bacterial cell wall fragments and peptidoglycan have been identified in RA synovial tissue and in other forms of arthritis, in macrophages and other APCs (12, 13). In addition to the potential role of microbial TLR ligands, a number of potential endogenous stress response proteins such as heat shock protein (HSP) 60 (14, 15), HSP70 (16, 17), and the extracellular matrix component biglycan (18) have been implicated as potential endogenous TLR ligands in RA. However, their role in the perpetuation of the chronic inflammation observed in the RA joint is not clear. Recently, the 96-kDa heat shock glycoprotein (gp96), an endoplasmic reticulum localized stress response protein also known as GRP 94, has been implicated in Ag presentation, tumor immunity, and activation of innate immunity (19, 20, 21). gp96 participates in the folding and assembly of many secretary and membrane proteins and is essential for the cell surface expression of TLR, including TLR2 and TLR4 (22). gp96 has been reported to activate professional APCs, such as dendritic cells (23, 24, 25) and macrophages (21, 26, 27, 28, 29), as well as neutrophils and monocytes (30), promoting the induction of IL-1β and TNF-α (28). Although gp96 is generally localized to the endoplasmic reticulum, it may gain extracellular access after cell activation (31), virus infection (32), or necrotic cell death (28). However, the potential role of gp96 in human disease, such as RA, has not been previously identified. In this study, we identified by immunohistochemistry, immunoblot, and ELISA that gp96 was highly expressed in the RA joint, while other HSPs that might serve as endogenous TLR ligands were less readily detected in RA synovial fluid (SF). gp96 induced the expression of TLR2 and cytokines in control and RA SF macrophages. The response by RA SF macrophages was significantly greater than observed with control macrophages and with peripheral blood monocytes from RA or healthy controls. We also demonstrated that macrophage activation by gp96 was primarily mediated through TLR2 signaling. Furthermore, cell surface TLR2 expression on macrophages from SF correlates with the level of gp96 present in the SF, suggesting a relationship between gp96 and the expression of TLR2. These novel findings provide insights into the mechanism by which gp96 promotes chronic inflammation in RA and identify gp96 as a potential new therapeutic target for RA. SFs were obtained from the inflamed joints of patients with RA, with other forms of chronic inflammatory arthritis including psoriatic arthritis, ankylosing spondylosis, arthritis associated with ulcerative colitis and Crohn’s disease, and patients with osteoarthritis (OA) and acute gout. Peripheral blood was collected from patients with RA and healthy donors. Synovial tissues were obtained from patients with RA and OA at the time of arthroplasty or by arthroscopy of actively inflamed joints. Synovial tissues from the arthritis-free controls were obtained at the time of autopsy or surgery for injury from the National Disease Research Interchange. RA patients were diagnosed according to the criteria of the American College of Rheumatology (33). The patients were recruited from the Northwestern Medical Faculty Foundation, the Rehabilitation Institute of Chicago, Northwestern Memorial Hospital, and the Academic Medical Center (Amsterdam, The Netherlands). These studies have been reviewed and approved by the institutional review boards. The cell-free SF or plasma was isolated by centrifugation to separate the cells and stored at −80°C. The cells were fractionated by Histopaque-1077 density gradient to isolate mononuclear cells, as described previously (11). Peripheral blood monocytes or SF macrophages were purified by negative selection using a monocyte enrichment system (StemCell Technologies). Abs to CD2, CD3, CD20, CD56, CD66b, CD123, and glycophorin attached to magnetic beads were used to deplete cells positive for these markers, leaving CD14+ macrophages from SF or CD14+ monocytes from peripheral blood. Primary human macrophages (control macrophages) were obtained from normal peripheral blood monocytes, isolated by elutriation followed by in vitro differentiation for 7 days, as previously described (11, 34, 35, 36, 37, 38, 39). Unless otherwise indicated, all cells were maintained in RPMI 1640 culture medium supplemented with 20% FBS, 100 U of penicillin, and 100 μg/ml streptomycin at 37°C in 5% CO2. Recombinant canine gp96 N-terminal domain (aa 22–337, gp96.NTD, or gp96) was expressed in Escherichia coli strain BL-21 as previously described (21, 27, 40). This fragment is 98.7% identical to the amino acid sequence of human gp96, with the sequence difference comprising three conserved substitutions, and mirrors the capacity of the full-length molecule to activate murine dendritic cells (41). Purification of recombinant gp96 was performed as previously described, with minor modifications, as follows (21, 27). Bacterial pellets were resuspended in 50 mM dextrose, 50 mM Tris (pH 8.0), 300 mM NaCl, 10 mM imidazole, and homogenates prepared in a French press. The homogenate was incubated with an equal volume of 10 mM Tris (pH 8.0), 50 mM KCl, 0.5% (v/v) Tween 20, 0.5% (v/v) Triton X-100, 300 mM NaCl, and 10 mM imidazole for 30 min on ice and insoluble debris were subsequently removed by centrifugation at 40,000 × g for 30 min at 4°C. The supernatant fraction was filtered (0.45 μm) and the recombinant protein bound to nickel-Sepharose resin (GE Healthcare). Columns were washed with 30 column volumes of 0.2% (v/v) Tween 20, 0.2% (v/v) Triton X-100, PBS, 40 mM imidazole (pH 8.0), and subsequently in depyrogenation solution (1% (v/v) Triton X-114 in sterile PBS, pH 7.4). Columns were then rinsed with sterile PBS until the absorbance at 230 nm returned to baseline and recombinant protein was subsequently eluted with sterile imidazole in PBS. Peak fractions were pooled and concentrated in a YM-30 spin column (Millipore). The level of endotoxin in the preparations used in this study was <0.5 endotoxin units (EU)/mg (21). Cells were incubated with gp96 (10 or 50 μg/ml) for 4 h or overnight, as identified in the text. The microbial TLR2 ligands peptidoglycan from Staphylococcus aureus (PGN-SA, 20 μg/ml), Pam3CSK4 (Pam3, 50 ng/ml), and lipoteichoic acid from S. aureus (LTA-SA, 5 μg/ml) (all from InvivoGen), and TLR4 ligands LPS (1 ng/ml; Sigma-Aldrich) or ultrapure LPS from E. coli K12 (LPS-UP, 5 ng/ml; InvivoGen) were used as positive controls. For intracellular staining, brefeldin A (10 μg/ml; Sigma-Aldrich) was applied along with the ligands. For Ab neutralization, either the monoclonal rat anti-TLR2 or TLR4 Abs (InvivoGen) or control rat IgG (10 μg/ml) was added into the macrophage culture 30 min before the addition of gp96 for macrophage activation. All reagents used in this study were examined for endotoxin contamination by the Limulus Amebocyte Lysate QCL-1000 Kit (BioWhittaker) according to the manufacturer’s instructions. All reagents used for the experiments with gp96 possessed endotoxin levels below the detectable level (< 0.1 EU/ml). In some experiments, the gp96 was preincubated with rabbit anti-gp96 N terminus Ab (1/100) or with polymyxin B (1 μg/ml), or preheated at 55°C for 1 h, or incubated with proteinase K (50 μg/ml) at 55°C for 45 min before incubation with macrophages for 4 h (n = 2). 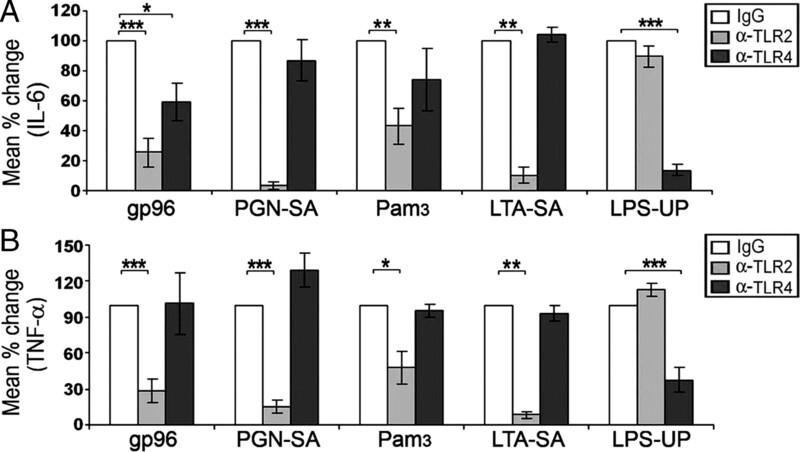 LTA-SA was the only non-TLR4 ligand with low endotoxin contamination, therefore, polymyxin B was incubated with the LTA-SA before addition to the cells. Following activation of mononuclear cells, the expression of TNF-α in CD14+ macrophages or monocytes was quantified by intracellular anti-TNF-α Ab staining along with anti-CD14 immunophenotyping using two-color flow cytometry as recently described (11). When using isolated homogeneous populations of macrophages, the secretion of IL-6 and TNF-α in culture supernatants was determined by ELISA (DuoSets; R&D Systems), while the expression of TLR2, TLR4, TNF-α, and IL-8 mRNA was determined by quantitative real-time RT-PCR (11). HEK-TLR2 and HEK-TLR4 cell lines (InvivoGen) are engineered HEK293 cells stably transfected with vectors expressing human TLR2 or TLR4 plus a vector expressing alkaline phosphatase reporter gene under the control of an inducible NF-κB promoter. HEK-TLR2 and HEK-TLR4 cell lines were incubated with gp96.NTD (2.5–20 μg/ml), PGN-SA (0.625–5 μg/ml), and LPS-UP (0.125–2 ng/ml) at 37°C for 24 h. The activation of the TLR2 and TLR4 cascade was determined by measuring alkaline phosphatase (OD655 nm) or IL-8 (by ELISA) in the culture supernatants. A double Ab sandwich ELISA was developed to detect full-length gp96 in SF (gp96-ELISA). Microtiter plates (Corning) were coated with 100 μl of goat polyclonal Ab against gp96 C terminus (capture Ab; Santa Cruz Biotechnology) at 0.5 μg/ml in PBS and incubated at room temperature overnight. The blocking and diluent buffer was PBS containing 0.1% BSA and 0.1% Tween 20. All samples were 1/40 diluted in diluent buffer and loaded at 100 μl/well in duplicate for 2 h at room temperature. The wells were then incubated with polyclonal rabbit anti-gp96 antiserum, which recognized the N terminus of gp96 (27), for 2 h at room temperature. Afterward, HRP-conjugated anti-rabbit IgG (GE Healthcare) at a 1/5000 dilution was incubated for 2 h. The reaction was developed using 3,3′,5,5′-tetramethylbenzidine substrate (Sigma-Aldrich) for 10–15 min and stopped by adding 50 μl of 2 N H2SO4. The concentration of gp96 was determined using a standard curve generated with recombinant canine gp96 (Stressgen). The correlation coefficient of the standard curve is >0.99 for all experiments. The concentration of gp96 in the tested fluids is interpolated from a standard curve included on each testing plate. Control gp96 did not show any reaction if either capturing or detecting Ab was absent from the reaction. The cell-free SFs were incubated with hyaluronidase (250 U/ml, type VI from bovine testes; Sigma-Aldrich) for 10 min at 37°C. The fluids were added to SDS-PAGE sample buffer and heated at 90°C for 5 min. The samples were loaded at the equivalent of 4 μl of original fluid. Controls were cell lysates from control macrophages (15 μg), synovial fibroblasts (15 μg), and recombinant proteins (20–50 ng). The protein extracts were resolved by 10% SDS-PAGE. Following transfer to polyvinylidene difluoride membranes (Immobilon-P; Millipore), the blots were probed with goat Abs to the C terminus of gp96, monoclonal anti-HSP70 and anti-HSP60 (Stressgen), and monoclonal anti-biglycan (R&D Systems) Abs. Densitometry analysis of immunoblots was performed by ImageJ software. The total protein contents of the fluids were visualized by Coomassie blue R250 staining. The cDNAs encoding the N-terminal extracellular domain of human TLR2 and TLR4 were generated by PCR and cloned into the pFUSE-hIgG1-Fc1 vector (InvivoGen) in frame to the Fc portion of human IgG1. The control vector contains only signal peptide from TLR2 cloned in frame to the IgG1-Fc. The physical interaction between gp96 and the extracellular domains of TLR2 and TLR4 were determined by the protein-protein interactive precipitation (IP) assay. Recombinant TLR2-Fc, TLR4-Fc, and Fc control proteins were isolated from culture supernatants of stably transfected Chinese hamstery ovary cell lines by affinity binding to protein G-agarose (Roche Diagnostics), followed by washing and incubation with macrophage lysates (precleaned with protein G-agarose) or the recombinant gp96.NTD at 4°C overnight. The resulting agarose complexes were washed and the precipitates were resolved by 10% SDS-PAGE, which were probed with a polyclonal rabbit anti-gp96 and Abs to human Fc to identify the TLR2-Fc (87 kDa), TLR4-Fc (93 kDa), and the control Fc (30 kDa). Local expression of gp96 in paraffin- and OCT- embedded synovial tissue was characterized by immunochemistry as described previously (40, 41, 42), with modifications. Paraffin-embedded synovial tissues were deparaffinized and rehydrated, and Ag retrieval was accomplished by boiling in 10 mM citrated buffer (pH 6.0) with 0.05% Tween 20 for 20 min. The endogenous peroxidase activity was quenched by 3% H2O2 for 5 min, followed by incubation with a monoclonal rat anti-gp96 (Lab Vision) or isotype-matched rat IgG2a control (eBioscience) at 2 μg/ml, diluted in PBS containing 1% of goat serum overnight at 4°C. OCT-embedded sections were washed and then blocked by 0.3% H2O2, followed by incubation with rat anti-gp96 or control Ab at 1 μg/ml overnight at 4°C. The secondary Ab used was HRP-conjugated goat anti-rat IgG. Color was developed by diaminobenzidine substrate, followed by counterstaining with hematoxylin. The slides were read by a blinded observer for gp96 expression defined as the product of the frequency (percent) and intensity (0–3) of staining in the lining or sublining. Additionally, median synovial lining thickness and inflammation (0–4) were scored as previously described (34, 43). ANOVA followed by the Tukey test was used for comparison between groups. Pearson’s product-moment correlation was used with R software (www.r-project.org) to determine the relationship between variables. The two-sided paired t test was used to analyze differences before and after stimulation. Significance levels were set at 0.05. Synovial tissues were obtained from patients with RA and controls to characterize the expression of gp96 by immunohistochemistry. The expression of gp96 was significantly increased in the synovial lining and the sublining of patients with RA compared with those with OA (p < 0.05 and 0.01) or the arthritis-free controls (p < 0.001; Fig. 1⇓, A and B). Only scattered cells within the lymphoid aggregates were positive for gp96. The majority of cells expressing gp96 in the sublining had the morphological appearance of macrophages. The expression of gp96 in the synovial lining was highly correlated (r = 0.71, p < 0.05) with lining thickness in tissues from patients with RA examined alone and when tissues from the three groups were combined (r = 0.80, p < 0.001; Fig. 1⇓D). Furthermore, the inflammatory score correlated with gp96 in the sublining of patients with RA (r = 0.83, p < 0.01) and when all three groups of tissues were combined (r = 0.76, p < 0.001; Fig. 1⇓D). gp96 is highly expressed in RA synovial tissue. RA (n = 9), OA (n = 5), or arthritis-free control (normal, n = 6) synovial tissues were examined by immunohistochemistry using rat monoclonal anti-gp96 Ab or IgG control. A, Representative staining for tissues from patients with RA, OA, and arthritis-free controls. The arrows identify positive cells in the OA synovial tissue. B, The expression of gp96 is presented as the product of the frequency and intensity in the lining and the sublining. C, Disease activity is presented as the median lining thickness and the inflammatory score (0–4). ∗, p < 0.05; ∗∗, p < 0.01, and ∗∗∗, p < 0.001. D, gp96 expression correlates with lining thickness and inflammation. The relationship between gp96 expression in the lining to the lining thickness and sublining to inflammation is demonstrated for all tissues examined. Since these RA synovial tissues were obtained from patients at the time of joint replacement surgery, a second group of OCT-embedded RA synovial tissues (n = 15), obtained from patients with clinical signs and symptoms of active disease before treatment, were analyzed by immunohistochemistry. gp96 was highly expressed in the lining (gp96 expression score, 144 ± 14) and the sublining (gp96 expression score,152 ± 22) of these tissues. The expression of gp96 in the sublining correlated (r = 0.69, p < 0.01) with inflammation, while gp96 in the lining correlated with median lining thickness (r = 0.57, p < 0.05). When the data for both groups of RA synovial tissues were combined, these relationships remained significant (r = 0.56 and r = 0.62, p < 0.01). These observations demonstrate that gp96 is highly expressed in the synovial tissues of patients with RA and that the expression of gp96 is related to the severity of the disease assessed by inflammation and lining thickness. For endogenous TLR ligands to activate through TLR2 or TLR4, they must reach the extracellular space. Therefore, we examined randomly selected cell-free SFs from patients with RA and OA for the presence of gp96, as well as for HSP60, HSP70, and biglycan, which have been implicated as potential TLR ligands that may be important in RA. All of the HSPs, including gp96, were readily detected in the control macrophage lysates, while biglycan was readily detected in lysates from the RA synovial fibroblasts (Fig. 2⇓A) using Coomassie blue staining to assess equality of loading (Fig. 2⇓B). 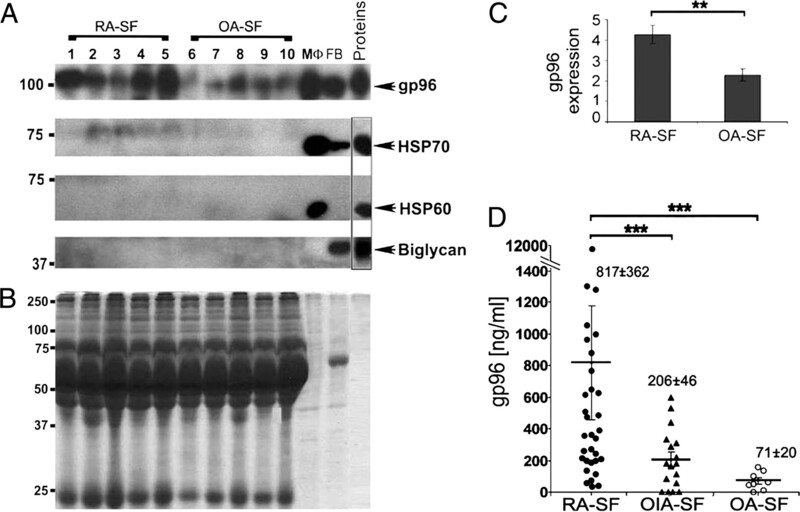 In contrast to HSP60, HSP70, and biglycan, full-length gp96 was readily detected in the RA and OA SFs (Fig. 3⇓A) using goat polyclonal Ab to the C terminus of gp96. Quantification of the gp96 bands by densitometry suggested that gp96 was increased (p < 0.05) in the RA SFs, compared with those from patients with OA (Fig. 2⇓C). gp96 is increased in RA SFs by immunoblot analysis and gp-96 ELISA. A, Immunoblot with monospecific Abs to gp96, HSP60, and HSP70 and biglycan. Randomly selected SFs from patients with RA (samples 1–5) and OA (samples 6–10) were resolved by 10% SDS-PAGE and detected for the presence of candidate endogenous TLR ligands by immunoblot analysis. Controls are macrophage (Mφs) and RA synovial fibroblast (FB) lysates (15 μg) and recombinant proteins for each Ab (20–50 ng). Each SF was loaded equivalent to 4 μl of original fluid. B, Coomassie blue R250 staining is presented as a loading control. C, Results of densitometry analysis of gp96 expression in the RA and OA SFs, normalized to 4 μl of SF. D, SFs were examined by ELISA for gp96. Samples are from patients with RA (total n = 32), with other forms of inflammatory arthritis (OIA) (n = 17) and with OA (n = 8). The mean ± 1 SE of gp96 concentration in each group is presented. ∗∗, p < 0.01; ∗∗∗, p < 0.005 between the indicated groups. gp96 activates macrophages. A, In vitro-differentiated control macrophages (n = 11) were incubated with medium alone or with gp96 (10 μg/ml) for 4 h. B, The gp96 or LPS was preincubated with rabbit anti-gp96 antiserum at 1/100 or control rabbit IgG before addition to macrophages for 4 h (n = 3–4). C, gp96 or LPS-UP (10 ng/ml) was incubated with macrophages in the presence of polymyxin B (1 μg/ml), or treated by heating (55°C for 1 h), or with proteinase K (50 μg/ml, 55°C for 45 min) before addition to macrophages for 4 h (n = 2). Results for B and C are presented as the percentage of IgG or medium alone control (none). The release of IL-6 and TNF-α in the culture supernatants was quantified by ELISA. ∗∗, p < 0.01 and ∗∗∗, p < 0.001 compared between the indicated groups. To more precisely quantify the gp96 in SFs, an ELISA was developed which detected full-length gp96 (Fig. 2⇑D). When multiple fluids were available from individual patients, only the first fluid available was included in this analysis. The concentration of gp96 detected in the SFs of patients with RA (817 ± 362 ng/ml, n = 32) was significantly greater compared with patients with other forms of inflammatory arthritis (206 ± 46 ng/ml, n = 17, p < 0.004) and patients with OA (71 ± 20 ng/ml, n = 8, p < 0.005). The level of gp96 in the fluids from patients with other forms of inflammatory arthritis was higher compared with those with OA, but this difference did not reach significance. Some patients had SFs obtained at multiple time points which were available for analysis. When all available fluids were examined, the results were similar to those presented in Fig. 2⇑D: gp96 was 687 ± 193 ng/ml in RA (n = 62), 255 ± 53 in other forms of inflammatory arthritis (n = 25, p < 0.002 vs RA), and 71 ± 16 in OA (n = 11, p < 0.001 vs RA). Of interest, gp96 was low in the acute inflammatory fluids from three patients with gout (131 ± 73 ng/ml). Together, these observations suggest that gp96 is released in the environment of chronically inflamed joints and that gp96 is increased in the fluids of patients with RA compared with those with other forms of inflammatory arthritis and OA. Previous studies have provided variable results concerning the ability of gp96 to activate macrophages through cell surface TLRs (21, 27, 44). Using very low endotoxin (<0.5 EU/mg) gp96 (10 μg/ml), macrophages differentiated in vitro from normal monocytes (control macrophages) were readily activated, defined by the secretion of IL-6 and TNF-α (Fig. 3⇑A). Preincubation of gp96 with monospecific Abs to gp96 suppressed the induction of TNF-α and IL-6 by gp96 (Fig. 3⇑B), but not by LPS, supporting the specificity of gp96 in macrophage activation. Even though the level of endotoxin in the gp96 was >20-fold less than that needed to activate macrophages (data not shown), additional studies were performed to evaluate the potential contribution of endotoxin. Treatment with polymyxin B had no effect on macrophage activation by gp96 while markedly suppressing activation by LPS (Fig. 3⇑C). Furthermore, heating and proteinase K greatly reduced macrophage activation by gp96 but not by LPS (Fig. 3⇑C). These observations demonstrate that macrophage activation by gp96 is not mediated by endotoxin. Experiments were performed to determine whether macrophage activation was mediated through TLR2 or TLR4, using neutralizing mAbs. The specificity of anti-TLR2 was documented by the inhibition of microbial TLR2 ligands PGN, Pam3CSK4, and LTA-SA, but not TLR4-mediated activation by LPS-UP, while the anti-TLR4 Ab suppressed activation by LPS-UP but not the TLR2 ligands (Fig. 4⇓, A and B). The production of IL-6 and TNF-α was significantly (p < 0.001, respectively) reduced when the macrophages were preincubated with neutralizing anti-TLR2 Ab before the addition of gp96, compared with preincubation with control IgG (Fig. 4⇓, A and B). There was a modest but significant (p < 0.05) reduction of gp96-induced IL-6 (Fig. 4⇓A), but not TNF-α (Fig. 4⇓B) by preincubation with anti-TLR4. gp96 activates macrophages primarily through TLR2. Macrophages were incubated with neutralizing Abs to TLR2 and TLR4 (10 μg/ml) or isotype control IgG for 30 min before activation by gp96 (10 μg/ml, n = 7), PGN-SA (20 μg/ml, n = 4), Pam3CSK4 (Pam3, 50 ng/ml, n = 5), LTA-SA (5 μg/ml, n = 3), and LPS-UP (10 ng/ml, n = 6) for 4 h. The release of IL-6 (A) and TNF-α (B) in the culture supernatants was quantified by ELISA. Results are presented as the percentage of control IgG. The 100% values for IL-6 (pg/ml) are: gp96: 269 ± 75, PGN-SA: 207 ± 91, Pam3: 453 ± 101, LTA-SA: 285 ± 88, LPS-UP: 901 ± 158; for TNF-α (pg/ml), the 100% values are: gp96: 531 ± 131, PGN-SA: 528 ± 214, Pam3: 3310 ± 464, LTA-SA: 1392 ± 407, LPS-UP: 2542 ± 473. ∗, p < 0.05; ∗∗, p < 0.01; and ∗∗∗, p < 0.001 compared with IgG controls. To further document which TLR signaling pathway was responsible for activation by gp96, HEK-TLR2 and HEK-TLR4 cell lines were used. The cell lines were activated as expected by the respective microbial TLR ligands (Fig. 5⇓, A and B, insets). Concentrations of gp96 as low as 5 μg/ml resulted in significant activation of the HEK-TLR2 cell line determined by NF-κB activation (Fig. 5⇓A) or the secretion of IL-8 (Fig. 5⇓B). The addition of gp96 to the HEK-TLR4 cells also resulted in significant activation at concentrations of 10 μg/ml and greater (Fig. 5⇓, A and B). The activation of the TLR2- expressing cell line by gp96 was significantly greater than observed with the HEK-TLR4 cells. Together, these results indicate that the activation induced by gp96 is mediated primarily through TLR2 signaling. gp96 activates HEK-TLR cell lines and interacts with the extracellular domain of TLR2 and TLR4. A and B, HEK-TLR2 (HEK-2) and HEK-TLR4 (HEK-4) cell lines were incubated with medium alone (0) or with increasing concentrations of gp96 (2.5–20 μg/ml) at 37°C for 24 h. Activation of the cell lines was identified by activation of NF-κB-alkaline phosphatase promoter-reporter, which is quantified by the spectrophotometer at OD 655 nm (A), or determined by the production of IL-8, quantified by ELISA (B). The results of PGN-SA and LPS-UP controls are presented in the insets. Results are the mean of two to three experiments performed in duplicate or triplicate, presented as fold increase compared with medium alone. ∗, p < 0.05; ∗∗, p < 0.01; and ∗∗∗, p < 0.001 compared with medium alone. #, p < 0.05 and ##, p < 0.01 comparing reactivity between HEK-TLR2 and HEK-TLR4 cell lines. C and D, Protein G-agarose-bound recombinant fusion proteins TLR2-Fc, TLR4-Fc, and the Fc control were used for IP with macrophage (Mφ) lysate (C, upper panel) or with recombinant gp96 (D). The IP between gp96 and the extracellular domain of TLR2 and TLR4 was determined by probing the blots with Abs to gp96. The presence of TLR2-Fc (87 kDa), TLR4-Fc (93 kDa), and Fc (30 kDa) in the macrophage IPs was identified by probing the same blot using an anti-human Fc Ab (C, lower panel). Previous studies (22) demonstrated that cellular gp96 binds to full-length TLR2 and TLR4 and is responsible for chaperoning these receptors to the cell surface (29). Recombinant TLR2-Fc and TLR4-Fc fusion proteins, expressing only the extracellular domains of TLR2 and TLR4, were used to determine their ability to bind to gp96. Both the wild-type gp96 from human macrophages (Fig. 5⇑C) and the recombinant gp96 (Fig. 5⇑D) were precipitated by binding to TLR2-Fc and TLR4-Fc, but not the control Fc. These observations demonstrate that gp96 is capable of interacting with the extracellular domains of both TLR2 and TLR4. To define the potential relevance of gp96 to RA, studies were performed to compare the response of RA SF macrophages to gp96 with normal and RA peripheral blood monocytes. Mononuclear cells were incubated with gp96 and the activation of monocytes and macrophages was determined by the expression of TNF-α in CD14+ cells examined by flow cytometry (Fig. 6⇓A). Following the addition of gp96, there was a significant increase of TNF-α/CD14+ cells with RA peripheral blood and SF, and the frequency (Fig. 6⇓B) and intensity (data not shown) of TNF-α in CD14+ cells was significantly greater (p < 0.02) in RA SF compared with normal, but not RA, peripheral blood. gp96 induces TNF-α in RA peripheral blood monocytes and synovial macrophages. Mononuclear cells isolated from peripheral blood (PB) of healthy donors (NL) and RA patients and from RA SF were stimulated with medium only (none) or gp96 (50 μg) in the presence of brefeldin A (10 μg/ml) overnight. Two-color intracellular Ab staining was performed with FITC-labeled anti-CD14 and PE-labeled anti-TNF-α or control IgG, which was analyzed by flow cytometry. A, Representative histograms of mononuclear cells from RA SF with or without gp96 stimulation stained with PE-labeled anti-TNF-α Abs. B, Summary of the induction of TNF-α in CD14+ monocytes from normal peripheral blood (n = 4), RA peripheral blood (n = 4), and CD14+ macrophages (Mφs) from RA-SF (n = 7). Data are expressed as the percentage (percent) of double-positive cells. ∗∗, p < 0.01 between the indicated groups. To examine the response of isolated macrophages to gp96, RA SF macrophages were isolated by negative selection and compared with in vitro-differentiated control macrophages. Incubation with gp96 induced the expression of both TNF-α and IL-8 in control and RA synovial macrophages determined by quantitative real-time RT-PCR (Fig. 7⇓, A and B). The activation of RA synovial macrophages was significantly (p < 0.05 and 0.02) greater than observed with control macrophages. Since activation of macrophages by gp96 was mediated through TLR2, the effect of gp96 on the expression of TLR2 and TLR4 was also examined. Incubation of both control and RA synovial macrophages induced the expression of TLR2 in a dose-dependent fashion and the induction of TLR2 was greater (p < 0.02) in RA synovial, compared with control macrophages (Fig. 7⇓C). There was no induction of TLR4 with either control or RA synovial macrophages (Fig. 7⇓D). These observations support the potential role of gp96 in the pathogenesis of RA mediated by inducing proinflammatory cytokines and TLR2. 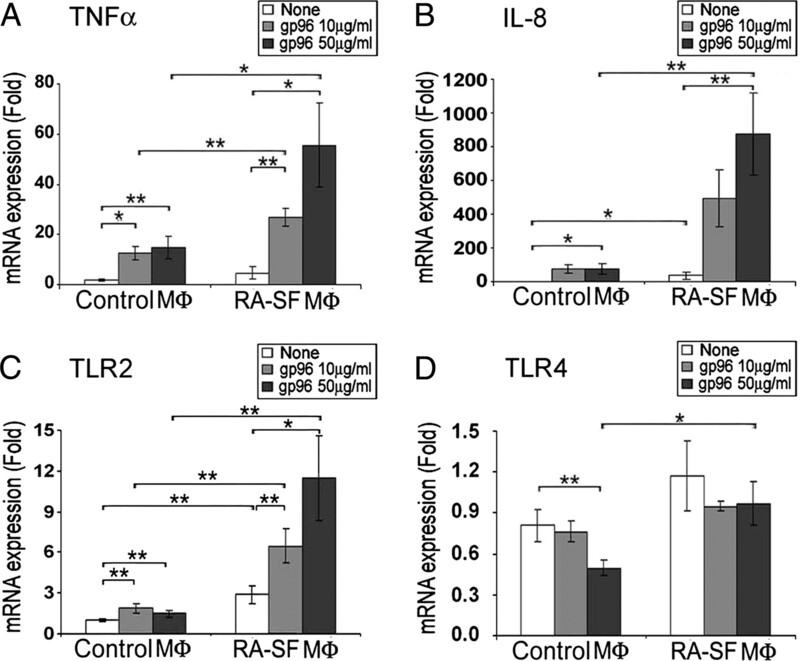 Increased TNF-α, IL-8, and TLR2 mRNA expression in RA SF macrophages by gp96 stimulation. CD14+ macrophages (Mφs) purified from RA SF (n = 5) by negative selection and in vitro-differentiated control macrophages (n = 7) were incubated with medium only (none) or gp96 at the indicated dosages for 4 h. TNF-α (A), IL-8 (B), TLR2 (C), and TLR4 (D) gene expression were determined by quantitative RT-PCR, presented as the fold of expression compared with medium alone for the control macrophages. ∗, p < 0.05 and ∗∗, p < 0.02 between the indicated groups. Since gp96 is a chaperone for the expression of TLRs in macrophages (29) and since gp96 induced TLR2 and cytokine genes through TLR2, the in vivo relationship between macrophage cell surface TLR2 and SF gp96 was examined. TLR2 expression on macrophages from RA SFs (Fig. 8⇓A) and those from patients with other forms of inflammatory arthritis (Fig. 8⇓B) demonstrated significant (p < 0.01 and 0.05, respectively) linear correlations (r = 0.62 and 0.65, respectively) with the concentration of gp96 in the same fluids. 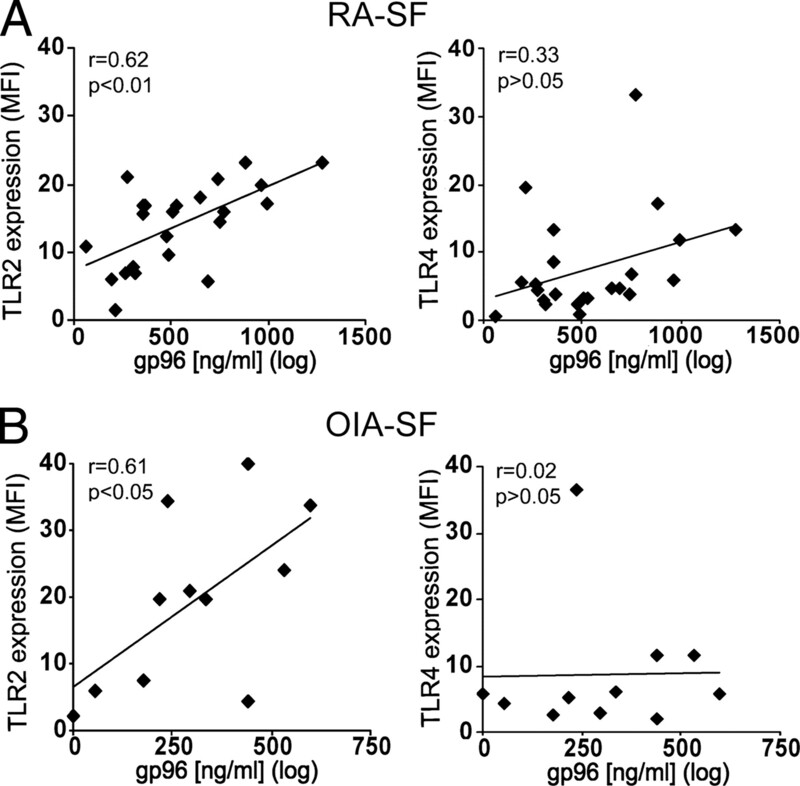 However, there is no correlation between macrophage TLR4 and gp96 level in RA (Fig. 8⇓A) or other inflammatory arthritis fluids (Fig. 8⇓B). These observations support the potential role of gp96 in the chronic activation of macrophages in the RA joint, which contributes to the pathogenesis of the self-perpetuating inflammation. The concentration of gp96 in the SF correlates with TLR2 expression on macrophage surface. The levels of gp96 present in the fluids of patients with RA and with other forms of inflammatory arthritis (OIA) were analyzed for their relationship to the cell surface expression of TLR2 and TLR4 on macrophages isolated from the same SFs. The gp96 concentration was determined by ELISA and the expression of TLR2 and TLR4 on the surface of macrophages is defined by mean fluorescence intensity (MFI) obtained by flow cytometry. The mechanisms contributing to the persistent activation of macrophages in the joints of patients with chronic inflammatory arthritis have not been fully elucidated. This study demonstrates that gp96 is highly expressed in RA synovial tissue and that the level of gp96 correlates with lining thickness and inflammation. Furthermore, gp96 is significantly increased in RA SF, demonstrating that this endoplasmic reticulum-localized chaperone is released during chronic inflammation. Very low endotoxin (<0.5 EU/mg) gp96 activated macrophages primarily through TLR2 and the activation of RA SF macrophages was significantly increased compared with the response by control macrophages or normal peripheral blood monocytes. In addition to signaling through TLR2, gp96 induced the expression of TLR2, which was greater with RA SF compared with control macrophages. Furthermore, supporting a potential role of gp96 in vivo, the concentration of gp96 in RA SF correlates with the level of TLR2 expressed on synovial macrophages. These observations suggest that in RA gp96 is released and functions as an endogenous TLR2 ligand capable of promoting the self-perpetuating activation of synovial macrophages. Other HSPs have been implicated as potential TLR ligands which may contribute to the pathogenesis of RA. To activate through TLR2 or TLR4, endogenous TLR ligands should be either expressed on the cell surface or released. In this study, we examined cell-free SF to identify endogenous TLR ligands released from cells, even though the concentration of any potential ligand might be much greater in the extracellular matrix of the synovial tissue. Earlier studies identified HSP70 in RA synovial tissue and fluid (16, 45). However, a more recent study, using highly specific mAbs, failed to identity increased HSP70 in RA synovial tissue (46). HSP60 has been implicated in RA, because it may be capable of activating monocytes of RA patients and controls through TLR2 or TLR4 (7, 15). However, in screening SFs from patients with RA and OA, neither HSP60 nor HSP70 were detected by immunoblot analysis, while each was readily detected in macrophage lysates. Additionally, biglycan, a small leucine-rich proteoglycan, recently identified as signaling through TLR2 and TLR4, although present in RA synovial fibroblast lysates, was not detected by immunoblot analysis of the SFs. In contrast, gp96 was readily detected by immunoblot analysis and was significantly increased in RA SFs, compared with those from patients with OA. The release of gp96 into the SF was not specific for RA since gp96 was detected by ELISA in fluids from patients with other forms of inflammatory arthritis and OA. However, the increased concentration of gp96 in the SFs appears to be related to chronic inflammation, since gp96 in the fluids of patients with acute gout was similar to those with OA. Other HSPs might contribute to the pathogenesis of RA. Recently, low molecular mass HSP22 was identified in RA synovial tissue and was capable of dendritic cell activation mediated through TLR4 (47). Supporting its potential role in RA, HSP22 was also readily detected in RA SF (data not shown). It is possible that endogenous TLR2 and TLR4 ligands might cooperate to promote the persistent activation of macrophages observed in RA. The mechanisms promoting the increased expression and release of gp96 in the chronically inflamed joints are not fully understood. Inflammatory cytokines such as IFN-γ and IL-2, which may be expressed in early RA, are capable of inducing the expression of gp96 (48, 49). Photodynamic therapy induced the cell surface localization of gp96 on macrophages, suggesting that cellular stress may lead to externalization of gp96 (31). Another mechanism regulating cell surface expression of gp96 is aminoacyl-tRNA synthetase-interaction multifunctional protein 1, which promotes targeting of gp96 to the endoplasmic reticulum, and its deficiency promotes cell surface localization (50). Necrosis, but not apoptosis, was shown to release gp96 (28). However, neither apoptosis nor necrosis is characteristic of RA (1). In fact, the induction of HSPs by cellular stress may protect against apoptosis mediated by both the extrinsic or intrinsic pathways (51). Therefore, although inflammatory mediators may promote the expression of gp96, the mechanism(s) responsible for its release remain to be determined. Our results document the ability of gp96 to activate primary human macrophages, differentiated in vitro from peripheral blood monocytes (control macrophages). Earlier studies demonstrated that gp96 was capable of activating human peripheral blood monocytes (30) and human monocytic cell lines (52). However, contaminating endotoxin may have confounded the interpretation of these studies. Subsequent studies demonstrated that low endotoxin gp96 induced ERK phosphorylation, but did not activate NF-κB using the RAW264.7 murine macrophage cell line (27). The low endotoxin recombinant gp96 used in this study activated murine bone marrow-derived dendritic cells, but only at 50 μg/ml (21). In the present study, using primary human macrophages, activation was strongly induced at10 μg/ml. Macrophage activation was mediated primarily through TLR2 since Abs to TLR2 suppressed the induction of both IL-6 and TNF-α and gp96 strongly activated HEK-TLR2 cells. Nonetheless, some activation through TLR4 was observed, since Abs to TLR4 modestly suppressed the gp96-induced expression of IL-6, although no reduction of TNF-α was observed. Supporting a potential minor role for TLR4, gp96 also weakly activated HEK-TLR4 cells. Our data clearly demonstrate that any activation that may occur through TLR4 was not mediated through contaminating endotoxin. Consistent with its ability to activate both pathways, recombinant and wild-type gp96 each interacted with the extracellular domains of both TLR2 and TLR4. Although our data suggest a potential minor role for TLR4 signaling in gp96-mediated macrophage activation, a recent study demonstrated that neither adenoviral expressed cell surface gp96 nor low endotoxin-soluble gp96 were capable of activating HEK293 cells expressing TLR4 (44). Furthermore, the mechanism responsible for the activation of human macrophages is distinct from the systemic autoimmune disease observed in mice transgenic for cell surface gp96 (53), which is mediated by the increased expression of TLR4 and activated by commensal flora and not through the cell surface expression of gp96 (44). Together, these observations suggest that differences in the methods of isolation or expression may determine whether or not gp96 is capable of activating through TLR4. Our data strongly support a potential role for gp96 in the pathogenesis of RA. Not only was gp96 highly expressed in the RA synovial tissue and extracellularly in the SF, but also the activation of RA SF macrophages by gp96 was significantly increased compared with the control macrophages and normal peripheral blood monocytes. Our earlier studies also demonstrated increased expression of TLR2 on RA synovial macrophages, compared with control macrophages (11). Additionally, activation of RA synovial macrophages by a microbial TLR2 ligand was increased compared with control macrophages and those from the SF of patients with other forms of inflammatory arthritis, suggesting the importance of TLR2 signaling in RA. In the present study, gp96 in vitro further induced the expression of TLR2 in RA synovial macrophages. gp96 in the SF was highly correlated with the expression of TLR2, but not TLR4, on macrophages from the SF, suggesting that in vivo gp96 may contribute to the increased expression of TLR2. These observations were not unique to RA, since gp96 was present in the SFs of patients with other forms of chronic inflammatory arthritis and TLR2 was also increased on the SF macrophages from these patients (11). The addition of a suboptimal concentration of gp96 to RA SF resulted in greater than additive macrophage activation (data not shown), suggesting that other factors in the fluids are capable of collaborating with gp96 to activate macrophages. In summary, increased expression and release of gp96 may promote a self-perpetuating chronic inflammatory response driven primarily through TLR2 activation. 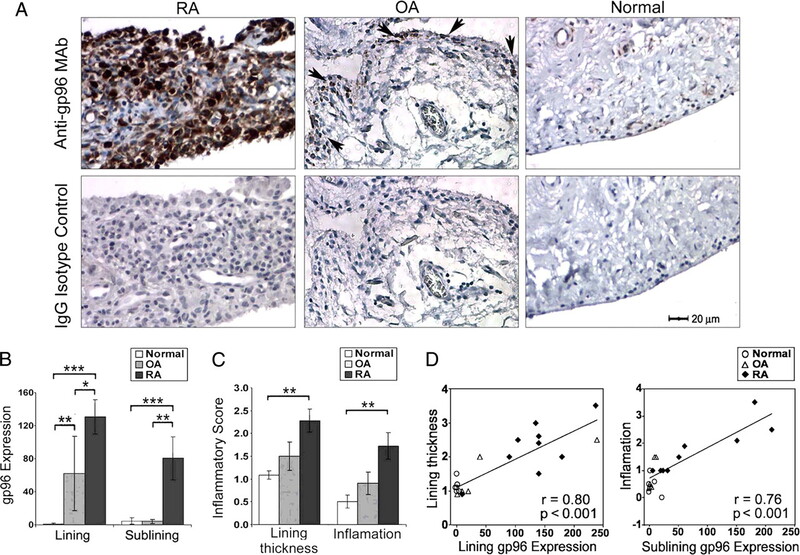 These observations suggest that gp96 and TLR2 signaling are potential therapeutic targets in RA, although the arthritis that develops in IL-1R antagonist-deficient mice is worse in mice lacking TLR2 (54). Nonetheless, supporting this approach, recent studies demonstrated that inhibition of TLR signaling ameliorated disease activity in collagen-induced arthritis, an experimental model of RA (55), and in patients with RA (56). We thank Dr. Chiang-Ching Huang (Department of Preventive Medicine, Northwestern University, Chicago, IL) for providing statistical analysis. We acknowledge Adedamola Adebayo for experimental assistance. ↵1 This work was supported by National Institutes of Health Grants AR055240, AR048269 (to R.M.P. ), and CA104392 (to C.V.N.) and a Within Our Reach Award from the American College of Rheumatology (to R.M.P.). ↵3 Abbreviations used in this paper: RA, rheumatoid arthritis; HSP, heat shock protein; gp96, 96-kDa heat shock glycoprotein; OA, osteoarthritis; PGN-SA, peptidoglycan from Staphylococcus aureus; SF, synovial fluid; LTA-SA, lipoteichoic acid from S. aureus; LPS-UP, ultrapure LPS; IP, interactive precipitation. Pope, R. M.. 2002. Apoptosis as a therapeutic tool in rheumatoid arthritis. Nat. Rev. Immunol. 2: 527-535. Firestein, G. S.. 2003. Evolving concepts of rheumatoid arthritis. Nature 423: 356-361. Ma, Y., R. M. Pope. 2005. The role of macrophages in rheumatoid arthritis. Curr. Pharm. Des. 11: 569-580. Gutcher, I., B. Becher. 2007. APC-derived cytokines and T cell polarization in autoimmune inflammation. J. Clin. Invest. 117: 1119-1127. Sergejeva, S., S. Ivanov, J. Lotvall, A. Linden. 2005. Interleukin-17 as a recruitment and survival factor for airway macrophages in allergic airway inflammation. Am. J. Respir. Cell Mol. Biol. 33: 248-253. Iwahashi, M., M. Yamamura, T. Aita, A. Okamoto, A. Ueno, N. Ogawa, S. Akashi, K. Miyake, P. J. Godowski, H. Makino. 2004. Expression of Toll-like receptor 2 on CD16+ blood monocytes and synovial tissue macrophages in rheumatoid arthritis. Arthritis Rheum. 50: 1457-1467. Radstake, T. R., M. F. Roelofs, Y. M. Jenniskens, B. Oppers-Walgreen, P. L. van Riel, P. Barrera, L. A. Joosten, W. B. van den Berg. 2004. Expression of Toll-like receptors 2 and 4 in rheumatoid synovial tissue and regulation by proinflammatory cytokines interleukin-12 and interleukin-18 via interferon-γ. Arthritis Rheum. 50: 3856-3865. Kyburz, D., J. Rethage, R. Seibl, R. Lauener, R. E. Gay, D. A. Carson, S. Gay. 2003. Bacterial peptidoglycans but not CpG oligodeoxynucleotides activate synovial fibroblasts by Toll-like receptor signaling. Arthritis Rheum. 48: 642-650. Seibl, R., T. Birchler, S. Loeliger, J. P. Hossle, R. E. Gay, T. Saurenmann, B. A. Michel, R. A. Seger, S. Gay, R. P. Lauener. 2003. Expression and regulation of Toll-like receptor 2 in rheumatoid arthritis synovium. Am. J. Pathol. 162: 1221-1227. Huang, Q., Y. Ma, A. Adebayo, R. M. Pope. 2007. Increased macrophage activation mediated through Toll-like receptors in rheumatoid arthritis. Arthritis Rheum. 56: 2192-2201. Schrijver, I. A., M. J. Melief, P. P. Tak, M. P. Hazenberg, J. D. Laman. 2000. Antigen-presenting cells containing bacterial peptidoglycan in synovial tissues of rheumatoid arthritis patients coexpress costimulatory molecules and cytokines. Arthritis Rheum. 43: 2160-2168.
van der Heijden, I. M., B. Wilbrink, I. Tchetverikov, I. A. Schrijver, L. M. Schouls, M. P. Hazenberg, F. C. Breedveld, P. P. Tak. 2000. Presence of bacterial DNA and bacterial peptidoglycans in joints of patients with rheumatoid arthritis and other arthritides. Arthritis Rheum. 43: 593-598. Boog, C. J., E. R. de Graeff-Meeder, M. A. Lucassen, R. van der Zee, M. M. Voorhorst-Ogink, P. J. van Kooten, H. J. Geuze, W. van Eden. 1992. Two monoclonal antibodies generated against human hsp60 show reactivity with synovial membranes of patients with juvenile chronic arthritis. J. Exp. Med. 175: 1805-1810. Bethke, K., F. Staib, M. Distler, U. Schmitt, H. Jonuleit, A. H. Enk, P. R. Galle, M. Heike. 2002. Different efficiency of heat shock proteins (HSP) to activate human monocytes and dendritic cells: superiority of HSP60. J. Immunol. 169: 6141-6148. Schett, G., K. Redlich, Q. Xu, P. Bizan, M. Groger, M. Tohidast-Akrad, H. Kiener, J. Smolen, G. Steiner. 1998. Enhanced expression of heat shock protein 70 (hsp70) and heat shock factor 1 (HSF1) activation in rheumatoid arthritis synovial tissue. Differential regulation of hsp70 expression and hsf1 activation in synovial fibroblasts by proinflammatory cytokines, shear stress, and antiinflammatory drugs. J. Clin. Invest. 102: 302-311. Asea, A., M. Rehli, E. Kabingu, J. A. Boch, O. Bare, P. E. Auron, M. A. Stevenson, S. K. Calderwood. 2002. Novel signal transduction pathway utilized by extracellular HSP70: role of Toll-like receptor (TLR) 2 and TLR4. J. Biol. Chem. 277: 15028-15034. Schaefer, L., A. Babelova, E. Kiss, H. J. Hausser, M. Baliova, M. Krzyzankova, G. Marsche, M. F. Young, D. Mihalik, M. Gotte, et al 2005. The matrix component biglycan is proinflammatory and signals through Toll-like receptors 4 and 2 in macrophages. J. Clin. Invest. 115: 2223-2233. Tsan, M. F., B. Gao. 2004. Heat shock protein and innate immunity. Cell Mol. Immunol. 1: 274-279. Srivastava, P.. 2002. Interaction of heat shock proteins with peptides and antigen presenting cells: chaperoning of the innate and adaptive immune responses. Annu. Rev. Immunol. 20: 395-425. Warger, T., N. Hilf, G. Rechtsteiner, P. Haselmayer, D. M. Carrick, H. Jonuleit, P. von Landenberg, H. G. Rammensee, C. V. Nicchitta, M. P. Radsak, H. Schild. 2006. 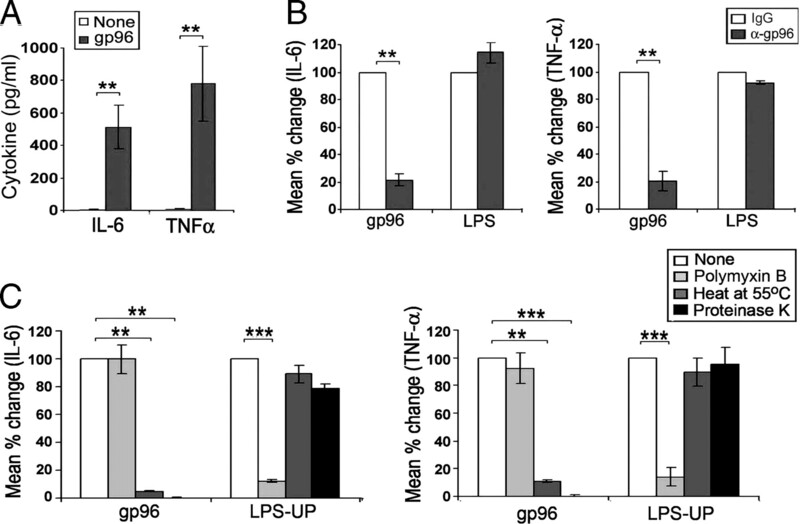 Interaction of TLR2 and TLR4 ligands with the N-terminal domain of Gp96 amplifies innate and adaptive immune responses. J. Biol. Chem. 281: 22545-22553. Randow, F., B. Seed. 2001. Endoplasmic reticulum chaperone gp96 is required for innate immunity but not cell viability. Nat. Cell Biol. 3: 891-896. Vabulas, R. M., S. Braedel, N. Hilf, H. Singh-Jasuja, S. Herter, P. Ahmad-Nejad, C. J. Kirschning, C. Da Costa, H. G. Rammensee, H. Wagner, H. Schild. 2002. The endoplasmic reticulum-resident heat shock protein Gp96 activates dendritic cells via the Toll-like receptor 2/4 pathway. J. Biol. Chem. 277: 20847-20853. Zheng, H., J. Dai, D. Stoilova, Z. Li. 2001. Cell surface targeting of heat shock protein gp96 induces dendritic cell maturation and antitumor immunity. J. Immunol. 167: 6731-6735. Hilf, N., H. Singh-Jasuja, P. Schwarzmaier, C. Gouttefangeas, H. G. Rammensee, H. Schild. 2002. Human platelets express heat shock protein receptors and regulate dendritic cell maturation. Blood 99: 3676-3682. Arnold-Schild, D., D. Hanau, D. Spehner, C. Schmid, H. G. Rammensee, H. de la Salle, H. Schild. 1999. Cutting edge: receptor-mediated endocytosis of heat shock proteins by professional antigen-presenting cells. J. Immunol. 162: 3757-3760. Reed, R. C., B. Berwin, J. P. Baker, C. V. Nicchitta. 2003. GRP94/gp96 elicits ERK activation in murine macrophages: a role for endotoxin contamination in NF-κB activation and nitric oxide production. J. Biol. Chem. 278: 31853-31860. Basu, S., R. J. Binder, R. Suto, K. M. Anderson, P. K. Srivastava. 2000. Necrotic but not apoptotic cell death releases heat shock proteins, which deliver a partial maturation signal to dendritic cells and activate the NF-κB pathway. Int. Immunol. 12: 1539-1546. Yang, Y., B. Liu, J. Dai, P. K. Srivastava, D. J. Zammit, L. Lefrancois, Z. Li. 2007. Heat shock protein gp96 is a master chaperone for Toll-like receptors and is important in the innate function of macrophages. Immunity 26: 215-226. Radsak, M. P., N. Hilf, H. Singh-Jasuja, S. Braedel, P. Brossart, H. G. Rammensee, H. Schild. 2003. The heat shock protein Gp96 binds to human neutrophils and monocytes and stimulates effector functions. Blood 101: 2810-2815. Korbelik, M., J. Sun, I. Cecic. 2005. Photodynamic therapy-induced cell surface expression and release of heat shock proteins: relevance for tumor response. Cancer Res. 65: 1018-1026. Berwin, B., R. C. Reed, C. V. Nicchitta. 2001. Virally induced lytic cell death elicits the release of immunogenic GRP94/gp96. J. Biol. Chem. 276: 21083-21088. Arnett, F. C., S. M. Edworthy, D. A. Bloch, D. J. McShane, J. F. Fries, N. S. Cooper, L. A. Healey, S. R. Kaplan, M. H. Liang, H. S. Luthra, et al 1988. The American Rheumatism Association 1987 revised criteria for the classification of rheumatoid arthritis. Arthritis Rheum. 31: 315-324. Liu, H., P. Eksarko, V. Temkin, G. K. Haines, III, H. Perlman, A. E. Koch, B. Thimmapaya, R. M. Pope. 2005. Mcl-1 is essential for the survival of synovial fibroblasts in rheumatoid arthritis. J. Immunol. 175: 8337-8345. Liu, H., Y. Ma, S. M. Cole, C. Zander, K. H. Chen, J. Karras, R. M. Pope. 2003. Serine phosphorylation of STAT3 is essential for Mcl-1 expression and macrophage survival. Blood 102: 344-352. Liu, H., H. Perlman, L. J. Pagliari, R. M. Pope. 2001. Constitutively activated Akt-1 is vital for the survival of human monocyte-differentiated macrophages: role of Mcl-1, independent of nuclear factor (NF)-κB, Bad, or caspase activation. J. Exp. Med. 194: 113-126. Ma, Y., H. Liu, H. Tu-Rapp, H. J. Thiesen, S. M. Ibrahim, S. M. Cole, R. M. Pope. 2004. Fas ligation on macrophages enhances IL-1R1-Toll-like receptor 4 signaling and promotes chronic inflammation. Nat. Immunol. 5: 380-387. Pagliari, L. J., H. Perlman, H. Liu, R. M. Pope. 2000. Macrophages require constitutive NF-κB activation to maintain A1 expression and mitochondrial homeostasis. Mol. Cell. Biol. 20: 8855-8865. Perlman, H., L. J. Pagliari, C. Georganas, T. Mano, K. Walsh, R. M. Pope. 1999. FLICE-inhibitory protein expression during macrophage differentiation confers resistance to Fas-mediated apoptosis. J. Exp. Med. 190: 1679-1688. Shahrara, S., M. A. Amin, J. M. Woods, G. K. Haines, A. E. Koch. 2003. Chemokine receptor expression and in vivo signaling pathways in the joints of rats with adjuvant-induced arthritis. Arthritis Rheum. 48: 3568-3583. Shahrara, S., A. E. Proudfoot, J. M. Woods, J. H. Ruth, M. A. Amin, C. C. Park, C. S. Haas, R. M. Pope, G. K. Haines, Y. Y. Zha, A. E. Koch. 2005. Amelioration of rat adjuvant-induced arthritis by Met-RANTES. Arthritis Rheum. 52: 1907-1919. Perlman, H., L. J. Pagliari, H. Liu, A. E. Koch, G. K. Haines, III, R. M. Pope. 2001. Rheumatoid arthritis synovial macrophages express the Fas-associated death domain-like interleukin-1β-converting enzyme-inhibitory protein and are refractory to Fas-mediated apoptosis. Arthritis Rheum. 44: 21-30. Perlman, H., H. Liu, C. Georganas, A. E. Koch, E. Shamiyeh, G. K. Haines, III, R. M. Pope. 2001. Differential expression pattern of the antiapoptotic proteins, Bcl-2 and FLIP, in experimental arthritis. Arthritis Rheum. 44: 2899-2908. Liu, B., Y. Yang, J. Dai, R. Medzhitov, M. A. Freudenberg, P. L. Zhang, Z. Li. 2006. TLR4 up-regulation at protein or gene level is pathogenic for lupus-like autoimmune disease. J. Immunol. 177: 6880-6888. Martin, C. A., S. E. Carsons, R. Kowalewski, D. Bernstein, M. Valentino, F. Santiago-Schwarz. 2003. Aberrant extracellular and dendritic cell (DC) surface expression of heat shock protein (hsp) 70 in the rheumatoid joint: possible mechanisms of hsp/DC-mediated cross-priming. J. Immunol. 171: 5736-5742. Schick, C., M. Arbogast, K. Lowka, R. Rzepka, I. Melchers. 2004. Continuous enhanced expression of Hsc70 but not Hsp70 in rheumatoid arthritis synovial tissue. Arthritis Rheum. 50: 88-93. Roelofs, M. F., W. C. Boelens, L. A. Joosten, S. Abdollahi-Roodsaz, J. Geurts, L. U. Wunderink, B. W. Schreurs, W. B. van den Berg, T. R. Radstake. 2006. Identification of small heat shock protein B8 (HSP22) as a novel TLR4 ligand and potential involvement in the pathogenesis of rheumatoid arthritis. J. Immunol. 176: 7021-7027. Chen, Y. G., B. T. Ashok, X. Liu, V. P. Garikapaty, A. Mittelman, R. K. Tiwari. 2003. Induction of heat shock protein gp96 by immune cytokines. Cell Stress Chaperones 8: 242-248. Anderson, S. L., T. Shen, J. Lou, L. Xing, N. E. Blachere, P. K. Srivastava, B. Y. Rubin. 1994. The endoplasmic reticular heat shock protein gp96 is transcriptionally upregulated in interferon-treated cells. J. Exp. Med. 180: 1565-1569. Han, J. M., S. G. Park, B. Liu, B. J. Park, J. Y. Kim, C. H. Jin, Y. W. Song, Z. Li, S. Kim. 2007. Aminoacyl-tRNA synthetase-interacting multifunctional protein 1/p43 controls endoplasmic reticulum retention of heat shock protein gp96: its pathological implications in lupus-like autoimmune diseases. Am. J. Pathol. 170: 2042-2054. Beere, H. M.. 2005. Death versus survival: functional interaction between the apoptotic and stress-inducible heat shock protein pathways. J. Clin. Invest. 115: 2633-2639. Panjwani, N. N., L. Popova, P. K. Srivastava. 2002. Heat shock proteins gp96 and hsp70 activate the release of nitric oxide by APCs. J. Immunol. 168: 2997-3003. Liu, B., J. Dai, H. Zheng, D. Stoilova, S. Sun, Z. Li. 2003. Cell surface expression of an endoplasmic reticulum resident heat shock protein gp96 triggers MyD88-dependent systemic autoimmune diseases. Proc. Natl. Acad. Sci. USA 100: 15824-15829. Abdollahi-Roodsaz, S., L. A. Joosten, M. I. Koenders, I. Devesa, M. F. Roelofs, T. R. Radstake, M. Heuvelmans-Jacobs, S. Akira, M. J. Nicklin, F. Ribeiro-Dias, W. B. van den Berg. 2008. Stimulation of TLR2 and TLR4 differentially skews the balance of T cells in a mouse model of arthritis. J. Clin. Invest. 118: 205-216. Abdollahi-Roodsaz, S., L. A. Joosten, M. F. Roelofs, T. R. Radstake, G. Matera, C. Popa, J. W. van der Meer, M. G. Netea, W. B. van den Berg. 2007. Inhibition of Toll-like receptor 4 breaks the inflammatory loop in autoimmune destructive arthritis. Arthritis Rheum. 56: 2957-2967. Vanags, D., B. Williams, B. Johnson, S. Hall, P. Nash, A. Taylor, J. Weiss, D. Feeney. 2006. Therapeutic efficacy and safety of chaperonin 10 in patients with rheumatoid arthritis: a double-blind randomised trial. Lancet 368: 855-863.